As the Behavioral Health Research Lead from the Ohio Department of Mental Health and Addiction Services, Dr. Surendra Bir Adhikari led the Nepali translation of Five Signs of Emotional Suffering outreach toolkit in collaborative partnership with Bhutanese Nepali Community of Columbus and Campaign to Change Direction, with support of Office of Behavioral Health Equity, Substance Abuse and Mental Health Administration (SAMHSA). This community based translational effort was thoroughly vetted with the Bhutanese Nepali community for cultural and linguistic appropriateness. Key gatekeepers of the community found the intervention culturally relevant and easily adaptable to drive awareness and improve behavioral health help seeking behavior. The innovative approach is centered on behavioral health issues including but not limited to: depression, mental disorders, anxiety, emotional suffering, suicidal ideation, trauma, and addictive disorders. 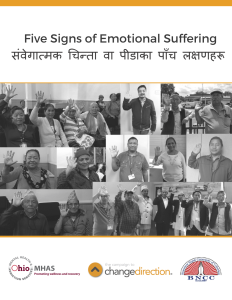 The overarching goal of this approach was to create a culturally and linguistically competent behavioral health toolkit in Nepali language, adapting Campaign to Change Direction’s “Five Signs of Emotional Suffering” outreach tool. The key objective was to empower members of the Bhutanese Nepali community to address critical behavioral health issue, especially depression and suicidal ideation that has seriously impacted the community.